Well, depends. It was described as a non-avian dinosaur, which it is in the most common definitions of Aves. But nowadays, when people talk of "birds", they have begun referring not to Archaeopteryx + sparrows (heaven forbid Microraptor become a bird, doesn't that mean Larry Martin wins? ), but to Avialae itself. Another feature common to discussions of dinosaur size is that only non-avialan dinosaurs are allowed. But that makes little sense. Small body size is one of the factors that led to the evolution of birds and flight in the first place, and it's unhelpful to put your dividing line right smack in the middle of that transition. Doing so will almost always result in the smallest "dinosaur" being the closest thing to the line on one side, with an even smaller "bird" right on the other side. In my opinion, all theropods, especially non-avian theropods outside the crown clade, should be eligible for competition. So I'm going to do something I don't think I've ever seen done before: pinpoint the smallest-known theropod outside the crown clade Aves. Note that the size estimates given below were determined via scale charts I've been making for a project that's been in the works since the end of 2010 and which should be debuting relatively soon (another sneak peak was given in the previous article on Enantiornis). To produce these charts, I basically make the most accurate reconstruction I can of a given animal and scale it to published individual bone lengths, then measure the resulting total skeletal length. Note that this will occasionally produce results that are slightly below average due to the effects of posture (while I stretch out the neck and skull for my measurements, many size estimates merely measure the vertebral column as if it were laid out in a straight line), and while this is slightly more subjective, I think it also gives a slightly more accurate figure for "life size". 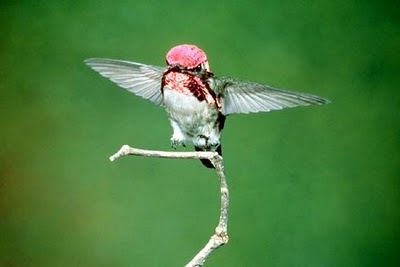 As many dinosaur fans will know, the smallest known dinosaur of all time is the Bee Hummingbird Mellisuga helenae. These little guys reach just 5cm in length (1.5in, much of it beak), and as far as we know, no Mesozoic theropods can challenge that record. But that doesn't mean Epidexipteryx is the winner. Those little scansors are gargantuan compared to some other non-avian dinosaurs. In the same size class as Epidexipteryx is Confuciusornis, which also had a maximum known length of 25cm. Other confuciusornithids are smaller, with Eoconfuciusornis at a mere 17cm (7in), for example. But given the range of sizes among C. sanctus, we might expect that larger individuals existed (this disclaimer should apply to all non-avian or at least non-euorthithian dinosaurs, which continued to grow after reaching maturity). Equal in length with the smallest confuciusornithids were some of the enantiornithians. It's not surprising that these, the first truly arboreal theropods, were also among the smallest. Getting around in trees and, perhaps as importantly, flying with a relatively primitive flight apparatus, are greatly aided by evolving very small sizes. Longirostravis, for example, was equal in length with Eoconfuciusornis, at 17cm, and the related Rapaxavis were just as small. Another advanced longipterygid related to Longirostravis, Shanweiniao cooperorum, had a wingspan of almost exactly 32cm (1ft) and a body length of 14cm (5in), a hair longer than the cathayornithids, and much longer when you take the tail into account. The total tail length is unknown due to having only the imprints of the proximal tail feathers, but it must have been well over 20cm (8in). Smaller still were the cathayornithids (though whether or not these form a natural group is pretty uncertain). Sinornis is largest at about 17cm long, but the other species are all approximately the same size, at 13cm (5in) long. Cathayornis yandica, "C." aberransis, Eocathayornis walkeri, and Gracilornis jiufotangensis are all the exact same length give or take a few millimeters. Also note that one or more of these may be synonymous with C. yandica itself, so proclaiming that species one of the the smallest non-avian dinosaurs wouldn't be too big of an exaggeration. But smallest of all are the enantiornithians from the La Huerguina formation in Las Hoyas, Spain. The only known specimen of Iberomesornis, measuring 9cm (3.5in) long, has been suggested to be a juvenile. Kurochkin (1995) argued that the lack of fusion in the metatarsals, poorly-ossified sacrum, and poorly defined articular surface of the humerus all point to this specimen being a young juvenile. Chiappe, in his book Mesozoic Birds: Above the Heads of Dinosaurs, disputed this interpretation. Chiappe argued that the partial fusion of the pelvis and the absence of any sutures between the neural spines and vertebral centra suggested it was not a juvenile, and that the bits of anatomy used by Kurochkin to argue that point could be due to poor preservation and/or a very basal phylogentic position. I have not, however, read anything to suggest that the contemporary Eoalulavis and Concornis (the first probably a basal enantiornithian closely related to Iberomesornis, the second a basal avisaurid), both about the same size as the sole Iberomesornis specimen, are juveniles. Concornis in particular appears to have a fused sacrum and proximally-fused metatarsus, the condition also seen in derived, presumably adult avisaurids. Of course, the possibility that all three specimens could have grown larger had they lived remains, but unless a study is produced showing these to be definitely 'juvenile', I reckon they should count, especially since there are several of them at the same size. 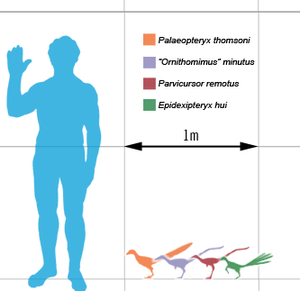 9cm is pretty well smaller than the smallest non-avialan dinosaur, the holotype of Parvicursor remotus, though keep in mind that that specimen's length is at least half tail, but also that a larger specimen, IGM 100/99 (possibly pertaining to a new species), is known. It's interesting to note that these are all enantiornithians. Most primitive euornithians were relatively large, tern-sized and up. 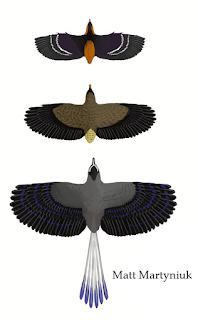 The smallest Mesozoic euornithians by my count were Chaoyangia (=Songlingornis), at about 10cm in length, slightly larger than the Las Hoyas birds. But this may also end up as a juvenile stage of some other chaoyangiform (=yanornithiform) bird. As noted above, the relatively small size of enantiornithians vs. euornithians may be due in part to arboreal habits and less advanced flight capability. The new trend: my theropod is smaller than yours! That's a huge monster that would appear in JP IV! Awesome new post is awesome. We need more reviews like this that give Mesozoic avialians their dues. Hmm. Years ago I tried estimating Mesozoic bird lengths myself, and the smallest were as follows. If I recall, these were featherless lengths. Of course some like Liaoxiornis are juvenile... What about crown birds, like Longrich's Irvine and Onefour birds from the Judith River Group? @Mickey Your list doesn't look TOO far off the mark from the lengths I came up with by measuring finished reconstructions, though there are some I'll want to go back and double-check like Eoalulavis and Longirostravis that are more than a few cm different. I didn't restore very fragmentary things like most Mesozoic avians (actually I did, I just didn't bother measuring them due to the high degree of speculation), Alexornis, etc., or universally-agreed upon juveniles like Liaoxiornis. I too got about 10cm for Jibeinia, but somewhere along the line of writing this post I cut it as a possible juvenile and for being larger than my Concornis/Eoalulavis estimate.